The Griot Museum of Black History, seen in this 2016 photo, is named for a West African term for storyteller. 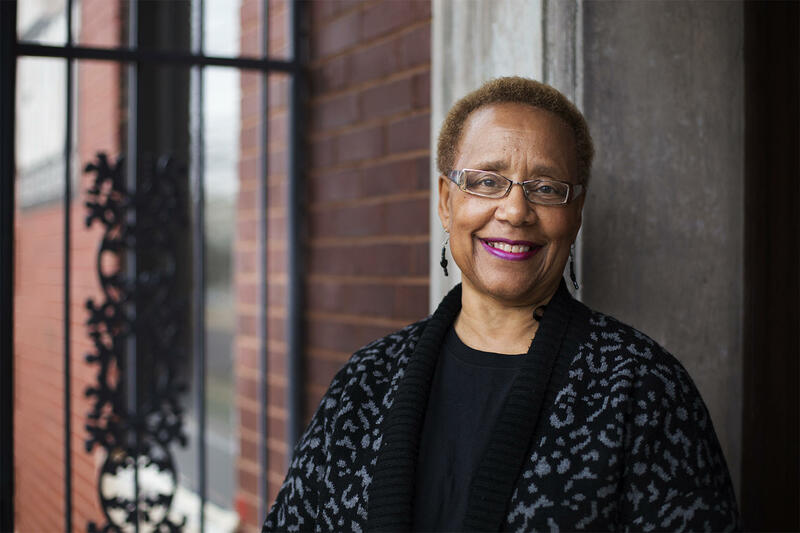 For two decades, Lois Conley, founder of St. Louis’ Griot Museum of Black History, has struggled just to pay the bills, hoping the roof, heating and air conditioning will last another season. But a recent donation is giving Conley some breathing room. The money is from a longtime supporter who died last year and remembered the Griot in his will. Conley declined to reveal the name or an amount. But it’s enough to cover a year’s worth of expenses, which includes paying an executive assistant, she said. In 2015, Conley told St. Louis Public Radio the Griot needs about $100,000 a year for property taxes, utility bills and basic upkeep. For Conley, the importance of the gift goes beyond the money. “That vote of confidence you need sometimes, that makes you want to continue doing what you’re doing,” she said. Another area in which things are looking up at the Griot is attendance. In its heyday, the Griot received 35,000 visitors a year. But in the early 2000s, the numbers began to decline, and by 2015, attendance had dropped to 4,000. But this past year, that number has nearly doubled. Lois Conley, seen in this 2016 photo, founded the Griot on St. Louis Avenue in the St. Louis Place neighborhood in north St. Louis in 1997. “We’ve been laughing, that this year, we just are not getting a break,” Conley said. A more diverse group of visitors is responsible for the uptick. “People who are not African American, people who are not senior citizens, people who are not necessarily straight, people in integrated families,” Conley said. Other than about $18,000 from the Regional Arts Commission and the Missouri Arts Council, most of the Griot’s regular budget comes from visitor fees. The recent, unexpected large gift is one of several developments that brighten the future of the institution. Another is a $20,000 grant to create a plan for optimizing the space inside the north St. Louis museum. The Griot includes a display of an enslaved African man trying to escape as a child looks on, as seen in this 2015 photo. Notice the child is missing his left hand. A good number of the museum's exhibits are in need of repair. The “Growing Griot” project is funded by the Washington University Center for the Humanities. Washington University students of African and African American Studies and the Sam Fox School of Design will spend a year looking at the institution’s building in north St. Louis. “Students will also be looking at how we take the space and use it to better define what kinds of programming we do and how we use it as a hub for creative thinking and interpretation around our cultural activities,” Conley said. “So we're pretty excited about that." The students’ plan for the future will help Conley as she pursues further donations. “I think we’ll have a situation that will be attractive to some people,” she said. 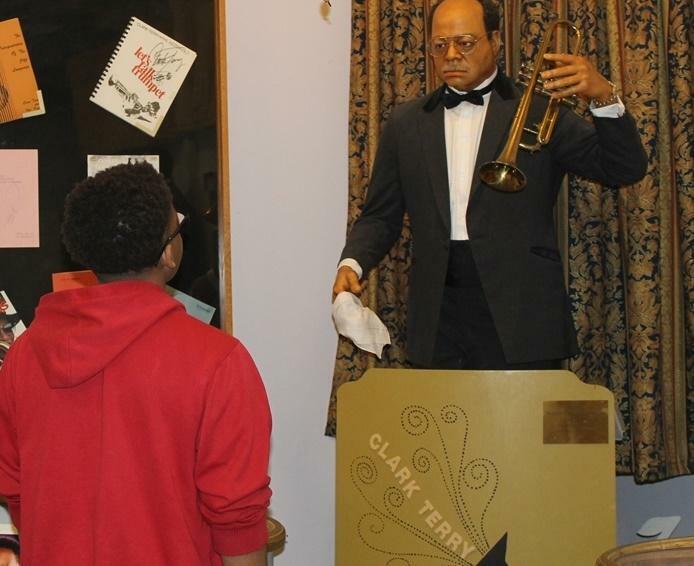 In this 2015 photo, a high school student meets the gaze of jazz musician Clark Terry, who played with the Duke Ellington and Count Basie orchestras. Terry was born in St. Louis in 1922. But Conley said securing the long-term future of the Griot could cost millions, on top of ongoing fundraising. She hopes to plan a capital campaign but needs a large donor to lead that effort. At 72, she’d like to think about retiring in a few years. The idea of leaving the museum in someone else’s care is now much more feasible, Conley said. “A year ago, I would have said, ‘Who wants to come in here, with no money, and struggle like this, besides me?’” Conley said. Griot visitors will soon enjoy some updates to some of the permanent exhibitions, when parts of the “#1 in Civil Rights” exhibit comes to the Griot from the Missouri History Museum. An upcoming temporary exhibition will involve the help of UMSL practicum students who are learning to stage an exhibition. The multimedia display they are working on, set to open later this month, highlights the predominantly African American neighborhoods of The Ville, Fountain Park and Lewis Place. Another upcoming event is a May 11 prayer breakfast in memory of an African American teenager from St. Louis who is thought to be the earliest known person with HIV in the United States. This portrait of De Andrea Nichols is part of the Griot's Brilliance, Beauty, Blackness exhibition, on display through April 13. 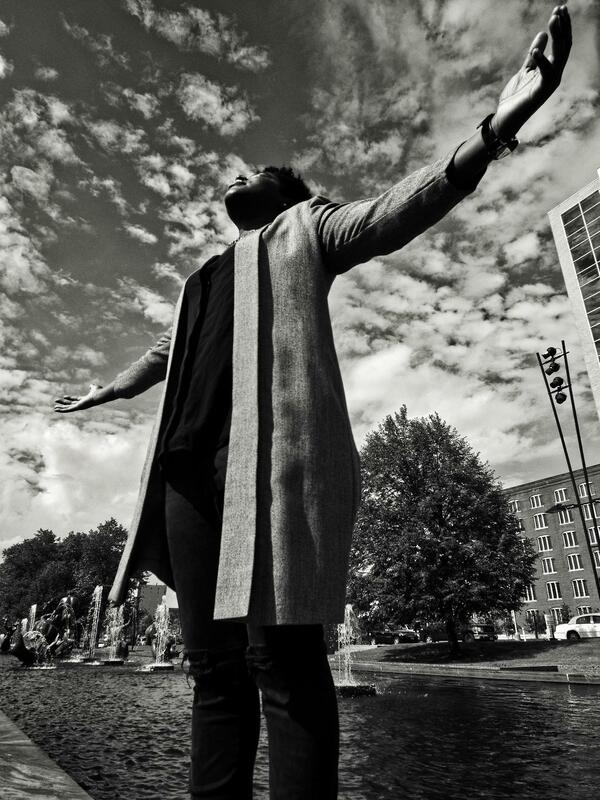 Currently, the Griot is exhibiting “Beauty, Brilliance, Blackness,” which features portraits of 20 women from St. Louis and Atlanta by photographer Ika Otura. On June 19, the museum will hold its second annual “40 Acres and a Mule” art show and sale. The event is a celebration of Juneteenth, which marks the announcement of the end of slavery in Texas and generally notes the abolition of enslavement in the Confederate South. Lois Conley of St. Louis grew up in Mill Creek Valley, where everything was in walking distance, and neighbors kept a close eye on each others’ children. “You felt safe; You felt protected. Everybody knew everybody,” Conley said. But in the late 1950s, the area between Union Station and Saint Louis University was condemned in the name of urban renewal. Families moved away and lost touch. Now St. Louis is a finalist in a national contest that would help fund a public art project documenting the destruction of Mill Creek.